This subtle ring offers you a meaningful way to celebrate and honor the love and union of two lives, destined to meet and bonded forever. 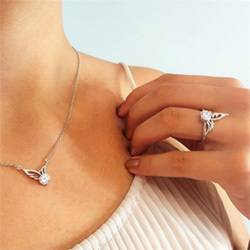 A delicate angel wing represents the invisible and unbreakable thread that connects two souls on their journey through life. Love my new ring. Beautiful! Love the way it fits but mostly it is just Beautiful.. It is beautiful and I just love it. I love it. It is in memory of my daughter and Mom who are always with me. Just got my ring today and love it!!!!! Arrived vety fast!. I love it! Its beautiful, thank you!!! I love this ring. I have large fingers but it looks great on. I have already received numerous complements on it. I love this ring. I have gotten so many compliments on it! Great ring m, I love the meaning behind it and the design!! In previous review of arrow ring, also goes with this ring. I purchased this ring for myself because of the angel wing to always keep my son, who passed away almost 6 yrs ago, close to me. Love it! LOVE my ring! Have gotten MANY complements! I am enjoying my Wing Ring. I love anything with angels or wings. I have lost 2 of my 3 sons. My life is not easy, I buy these Rings knowing they remind me that my boys are with me always. Love it looks amazing ! I love my ring. I wear it everyday. Great quality. I will definitely bring ordering again. The first order was damaged when it arrived. I was deeply grateful that a new one was sent out so quickly and rectified. Thank you. I purchased six pieces from you and will continue yo enjoy your services! The ring is absolutely beautiful, and is very impressive on my mom’s hand. It’s the perfect size (not too showy) and she loves it! This ring is so beautiful on. Its a gorgeous ring. They hold so much meaning to me. I love all of my jewelry that I have bought from you. Its gorgeous and your prices are so fantastic. I plan on buying alot more. Love, love this ring. It is truly better then I thought it would be. Will be ordering more at a later date. Thank You very much for warranty on the first ring.. My Wife is very happy. I love this angel ring & the meaning behind it!! Love my ring. The first one lost a stone, was replaced immediately!! Fast service. I wear it with pride! Thank you so much!!!! I love my new ring Angels or anything to do with them is my life! This ring is truly exquisite and was even more beautiful than I expected! I will totally be buying more angel inspired jewelry from this site If I could give them more than 5 stars, I would! Love angels! And love the ring! Love this ring. It’s more beautiful in person than it appears in the picture. Love my new ring...will definately be buying more products. Beautiful ring,also ordered my granddaughter one and she loves it to. Love it! Beautiful ring, high quality. Lovely ring. Because I needed a 10 to fit over my ring finger knuckle I’ve decided it fits my index finger better when seated where it belongs. So cool there. This is a beautiful ring. I can wear it on my fore finger or my thumb. It is georgeous! This beautiful ring signifies the loss of my Son and daughter in laws first child. Broken hearts will heal but the beautiful ring will be a reminder of an angel waiting for them in heaven. Thank you for making such a gorgeous ring!! This ring is everything I expected. Have gotten lots of compliments! Lovely ring with unique design! Really love this ring. It’s so beautiful. I have sort of small fingers & it was a little longer than I expected. But I ADORE it. The quality was much better than expected and it looks really nice on my finger. Great Job! This is an absolutely beautiful ring. I purchased this for my daughter who fell in love with it! After writing an email about being disappointed about the quality of 1 of 3 rings purchased, they not only responded promptly, but they went above and beyond to make every effort to make sure i was completely satisfied. Even going so far as to replacing the 1 ring free of charge, swiftly, without question, or hesitation!! I cant say enough about their outstanding customer service, i still am in absolute love with my ring!! Thank you so much!! This was a gift for my best friend. She absolutely loved it!!! This is a gift for my best friend! I'm sure she will love it!! Great buying experience. Arrived much sooner than expected. My ring is beautiful and when I wear it I feel close to my mom who passed away November of 2017. It shines a glitter of sparkles even when it's been gloomy. Love the ring. My baby passed in 2012 so have an angel in heaven and now represent him with the ring. It was a gift I loved it and ordered myself one yesterday..
Love the ring. Fits great. Love the product and looking forward to ordering more items from you. Love Love Love my ring as far as I can tee prongs are good and all stones are in tact. First ring was missing stones and prongs were damaged. Was sent new ring. I'm very impressed with the company and Wii be purchasing more merchandice. It a tad bigger than I expected but it's very nice. I enjoy it. The ring is just beautiful. I hope to order more of your products as they are just beautiful. I bought the necklaces for a couple people that haven't received them yet for Christmas. Personally, I love the idea of the expression with jewelry. My intentions are to buy more for my friends that have lost or may lose a love one. This jewelry has to be the best thing you could possibly give someone. Thank you for such an idea and beautiful jewelry to express it! What can I say??? This ring is even more beautiful in person! This is so sparkly and steady in nature....it’s perfect! !